You must make reservations at least 5 minutes in advance of the time at Boca Chica Restaurant. Mariachi Flor y Canto performs regularly at Boca Chica every fourth Saturday of the month from 6:30 p.m. to 9:30 p.m., and for special occasions Nicolas Carter(Latin harp)and Pedro Torres(guitar)perform regularly at Boca Chica every second Saturday of the month from 6:30 p.m. to 9:30 p.m., and for special occasions. We cater fiestas for birthdays, graduations, office parties, Grooms dinners, social gathering and many other special events. Let us help make your party a success! For smaller or more casual fiestas, we have the Party Tray Menu with a large selection of delicious food items you may choose to make your party special! For larger events such as weddings, anniversaries, quinceaneras or other formal celebrations, please call us to speak to our Full Service Catering manager Catering manager Jose Frias at (651) 222-8499. 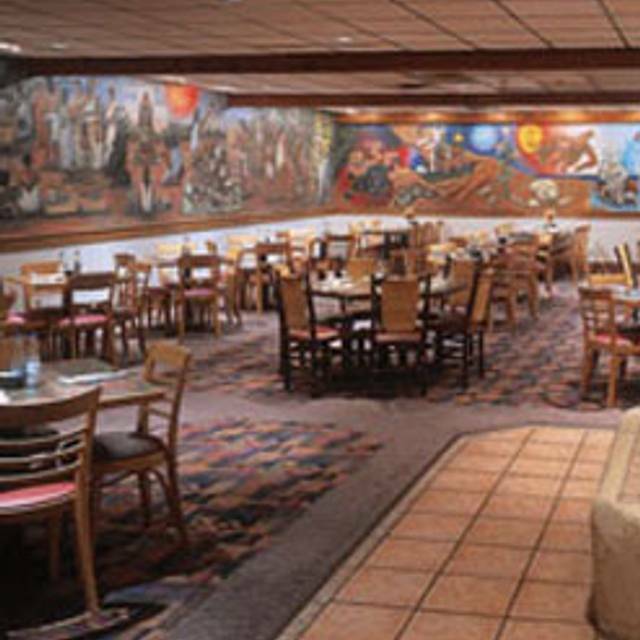 Boca Chica Mexican Restaurant has served the flavorful, authentic cuisine of Mexico since 1964. It was then that Guillermo and Gloria Frias opened the doors to their new restaurant that seated only 28 patrons. Today, Boca Chica has grown substantially and is rated "one of the best Mexican restaurants in the Twin Cities," according to the Minneapolis-St. Paul Magazine’s March 2018 issue. The authenticity of the food is maintained by making everything from scratch, the old-fashioned way, with fresh ingredients. Even the fiery salsa is still made with fresh tomatoes, chiles, and that special Frias family touch. 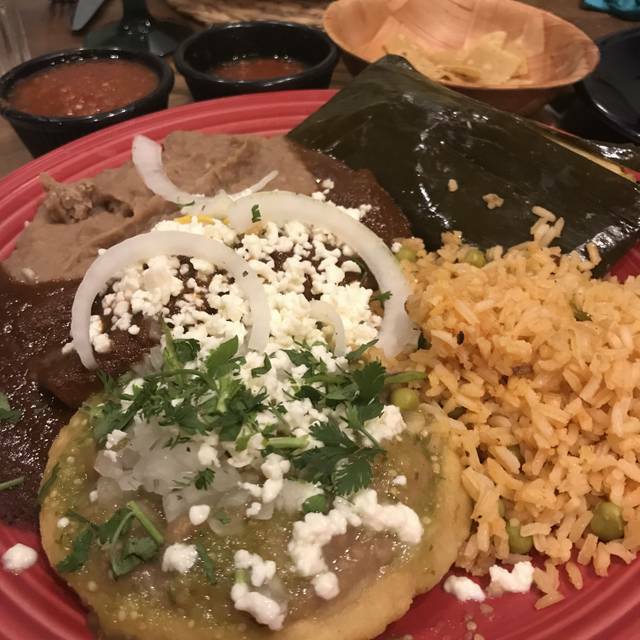 Our menu includes some of the more traditional foods such as guisados, sopes, carne asada, chile rellenos, and tamales. Taste is never compromised. We also have a full bar featuring the city’s best selection of Mexican beers and premium tequilas. Voted "Best Margarita" by City Pages. Two cheese & onion enchiladas topped with a gravy style sauce & a blend of Monterey Jack & cheddar cheeses. Served with a side of sour cream, sopa, your choice of Spanish rice, refried beans or black beans. Two chicken enchiladas topped with a gravy style seasoned tomato sauce & melted cheddar cheese. Served with your Spanish rice, refried beans or black beans. Two enchiladas filled with Monterey Jack cheese, topped with chile guajillo sauce and Mexican white cheese. Served with sopa & your choice of refried beans, black beans or spanish rice. Two chicken enchiladas are topped with green chile sauce, Mexican white cheese & cilantro. Served with sopa & your choice of Spanish rice, refried beans or black beans. Two beef enchiladas topped with chile gravy & melted cheddar cheese. Served with sopa & your choice of Spanish rice, refried beans or black beans. Two chicken enchiladas rolled in our own mole sauce, topped with Mexican white cheese & onion. Served with sopa & your choice of Spanish rice, refried beans or black beans. Spicy Mexican pork sausage is scrambled with fresh eggs, served with potatoes & refried beans. Your choice of either corn or flour tortillas. Two eggs sunny side up on a fried tortilla, topped with spicy pork sauteed in your choice of red or green chile sauce. 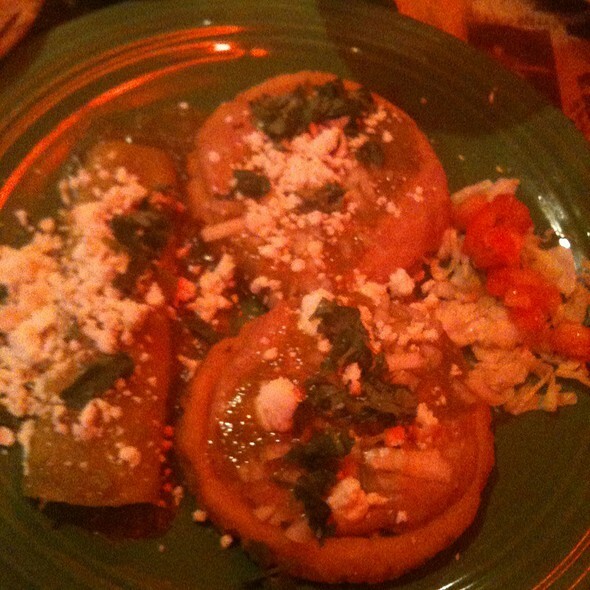 Served with potatoes, refried beans & either corn or flour tortillas. Seasoned beef taco with shredded lettuce, cheese & tomatoes in a crisp corn shell. Taco filled with seasoned beef, shredded lettuce, cheese & tomatoes in a soft corn tortilla. Chicken taco with shredded lettuce & tomatoes in a soft corn tortilla. Soft corn tortilla filled with either cheese or beef, rolled, topped with chile gravy & melted cheese. Seasoned beef taco deep fried in a flour tortilla. Flat crisp tortilla, topped with refried beans, shredded lettuce, tomatoes & cheese. Flat crisp tortilla topped with refried beans, seasoned beef, shredded lettuce, tomatoes & cheese. Rolled soft flour tortilla filled with refried beans & seasoned beef. Rolled soft flour tortilla filled with refried beans & cheese. Two soft corn tortillas filled with onions & tomatoes with your choice of grilled seasoned beef steak or chicken, topped with Mexican white cheese & a slice of avocado. Served with a side of Spanish rice, refried beans or black beans. A mild green pepper stuffed with cheese & onion, dipped in egg batter deep fried. Topped with your choice of traditional style caldillo (broth) or tex-mex style with gravy and melted cheddar cheese. Served with sopa & your choice of Spanish rice, refried beans or black beans. A broiled six ounce tilapia filete is topped with a mango chipotle salsa. Served with a side of white rice & your choice of refried beans or black beans. Two skewers of seasoned shrimp on top of a bed of white rice. Accompanied by your choice of refried beans or black beans with Boca Chicas' own salsa roja. Two soft corn tortillas filled with pieces of tender white fish fillets topped with lettuce, tomato & your choice of either a seasoned tomato sauce or a cream sauce spiced with chipotle. Served with Spanish rice or choice of beans & fresh guacamole. A 4 oz ribeye steak served with a salsa picante & one chicken enchilada topped with green chile verde sauce, Mexican white cheese & cilantro. Served with sopa & your choice of refried beans or black beans, fresh guacamole & corn or flour tortillas. Two soft flour tortillas filled with refried beans & spicy pork sauteed in red chile chipotle sauce or in green chile sauce or one of each. Served with Spanish rice. Choose either seasoned beef or chicken with shredded lettuce, tomato, onion, cheese, guacamole, jalapeno peppers & sour cream. All served in a deep fried tortilla "dish", with your choice of western dressing or salsa. Our chimichanga is deep fried & filled with shredded beef in a red chile chipotle sauce. Served with Spanish rice, refried beans, fresh guacamole & sour cream. Three flute shaped tacos filled with shredded chicken, topped with sour cream, Mexican white cheese & cilantro. Served with fresh guacamole & your choice of Spanish rice, refried beans or black beans. Two handmade corn tortillas topped with refried beans, green chile sauce, onions, Mexican white cheese & cilantro. Served with Spanish rice. My favorite restaurant. My first choice and am never disappointed. Boca Chica is my family restaurant for a lifetime! Plus, to be surprised at the end with a birthday sundae and a song! Memories like that cannot be replicated! Love the staff and management there! We will be back!! This place is my favorite. The staff is always amazing. I recommend this place whenever I can. I have eaten at Boca Chicad for years. This visit was very disappointing. The food was very bland...no flavor at all. I don’t know that I will ever return. We are never disappointed at Boca Chica. Food wonderful and our waitress was especially sweet. Always our favorite place for a special meal. Mariachi music, food exactly as advertised, waitress was sweet and efficient. Not sure if there's a better Mexican restaurant experience locally. Everything was great! Great service. Great food. Slow service, ended up having to ask another server for help. Enchiladas were made incorrectly (with the wrong protein) and were mediocre. Rice was hard. Beef tacos and chilled rellenos were okay - not bad but not great. Ran out of dessert. A favorite for years! Great food and sometimes the mariachis are there playing as well! Food was great and the service was kind and helpful. We hadn’t been to Boca Chica in a while since we moved farther away so didn’t know what to expect but we were not disappointed as the food and service was excellent? 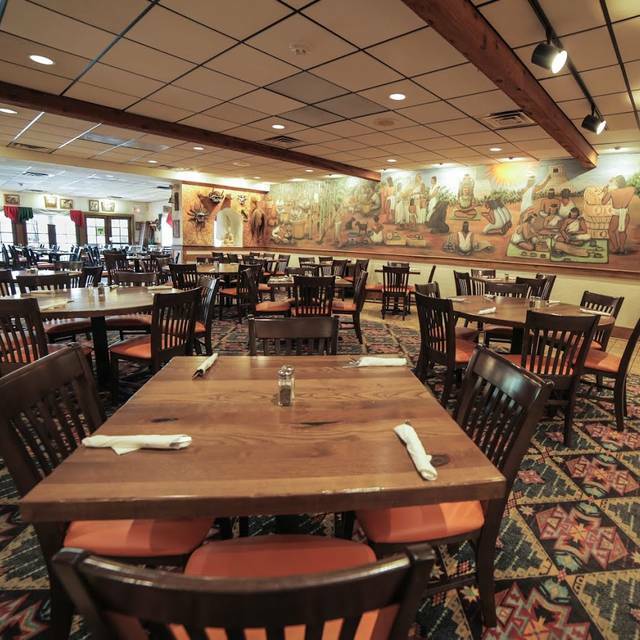 We love the great food and atmosphere at Boca Chica! Best in the Twin Cities by far. Authentic food, great drinks. Great atmosphere. Also good for birthdays. You can’t go wrong here. The servers and Bartenders are very friendly. The food is delicious. The ambiance is wonderful. Great authentic Mexican food for reasonable prices. Boca Chica's carnitas are the best you can find anywhere! Our server, Vida, is exceptional! She is knowledgeable about the menu options, and efficient with our service. Most of all she is so friendly and welcoming each and every time we see her. Pretty good food, inattentive service. Server came only to take orders, bring food and deliver the check. Boca Chica was a great spot for lunch. Food was great—several people had the buffet which offered plenty of options. flautas were another favorite. Super service! We lost power and you didn’t miss a beat. Wait staff did an awesome job. We took advantage of the Sunday brunch and were very much pleased. First, there is plenty of seating and the atmosphere is "cozy." We had made a reservation for six and were promptly seated by a table near the fireplace. Our server was helpful, attentive, and friendly. The Sunday brunch/buffet offered a large variety of choices, even pancakes and sausage, an option that pleased our grandson. The Mexican dishes were excellent. At $14.95/person, I feel the brunch is really a good value for families. I would not hesitate returning to Boca Chica. Boca Chica has been a WestSide gem for years! My sisters and I will always consider this restaurant 'home' for brunch, lunch or dinners! Really good authentic Mexican food! Thank you Frias family! We were greeted and seated with our reservation right away. The hosts and servers were friendly and prompt. The salsa and chips just kept coming. Loved my street tacos and portions were good. All the food tastes great including the desserts. Very good authentic food, with a large menu. Good and polite service. Boca never disappoints. Just wonderful, and authentic. Poco Logo margarita is to die for, as are the enchiladas! Highly recommend! This was not our first time at Boca Chica, my family has been coming here for decades. And it never disappoints. We enjoy the neighborhood welcoming atmosphere, the really good food that encompasses some more authentic Mexican dishes as well as typical Tex-mex style dishes that are found in Mexican American restaurants, but done better. We love the sopa with fideos served in front of most entrees, and the salsa is really good, especially the one with more spice. The mole is really good, though none of us had it this time. Service was good and accommodating our request for a booth (one side had booth seats, the other was chairs, this is how their dining area is configured.) The food service is quick, but not rushed. Drinks were good, strong enough, but not too much so. Two of us had a spiked mango lemonade that was not overly sweet, quite good. All in all, it was an enjoyable, comfortable, good dinner. Wouldn’t go back again. It was just okay. Excellent as always. Has been our family's go to Mexican restaurant since I was a child. Now I'm almost 60 years old .... bringing my kids and grand kids and still enjoy it as much as ever! Service was good and we were seated at our reserved table right away. Our waitress took good care of us. It was a busy Saturday night. My husband's food was cold and not a lot of taste actually. He had the chicken rellenos which were basically ground up chicken. They did remake it although the rest of us were done by the time they brought another serving so we ended up taking it all home. I would have been happy with a price adjustment. The price was a bit high but overall it was a fun night. The reservation experience went very well and quite easy to use. Waitress that served us was totally awesome! (Lisa) She was able to also speak Spanish to one of our residents to help him decide on a menu item. She was great and helpful and awesome! We have brunched at Boca Chica before and it seemed to have had more options in the past. The woman running the egg station was too backed up with orders that she refused to take any more. Perhaps they should add another person there to accommodate Sunday brunch. The arroz con leche is muy sabroso! Also, the zucchini enchiladas were really good. It would be nice to have the option of fresh fruit for dessert. It was a pleasant experience, but we probably won't be back for a little while. Service was poor. Long wait each time we had request for more water , check and to get food. No offer to comp anything . Just one word we we voiced our complaint at check out. Sorry was all they said. Best Nexucan in the Twin Cities. We drive from Minnetonka and it’s worth it!!! Was just OK overall, we went there for Restaurant Week and it didn’t meet our expectations. My food was pretty salty and the dishes seemed unoriginal. The menu made it seem like my wife and I ordered two very different things, but when the plates came out, the dishes looked nearly identical with the exception of the meat. We came for restaurant week. There was a lot of food but I like a spicier meal. The guacamole was pretty dull but there was a lot of it. It seemed wasteful. My husband liked the soup. The flautas, chicken mole enchilada and tamale were good. Our waitress was very efficient.